Our journey begins with an early morning scenic drive through rural Costa Rica to Tenorio Volcano National Park. From there, we’ll begin our 4-hour intermediate hike (approximately 7km) through the surrounding tropical rainforest. 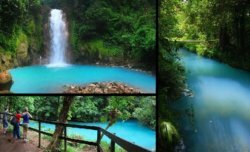 We then arrive at “Los Teñíderos” where two rivers come together to create the celestial turquoise blue water color giving the river its name. We will hike to the spectacular Río Celeste waterfall – the perfect place to take photos – and then hike our way back to the start of the trail. Departure / Return at Luna: Schedule with our Guide. Recommended ages: 10 to 65 years old, but this is a strenuous hike and people should be in good shape. Rate: $115, please inquire for extra transportation costs at the reception. Includes: Transport from La Fortuna (extra charge from Finca Luna Nueva Lodge), naturalist guide, entrances to park and lunch.